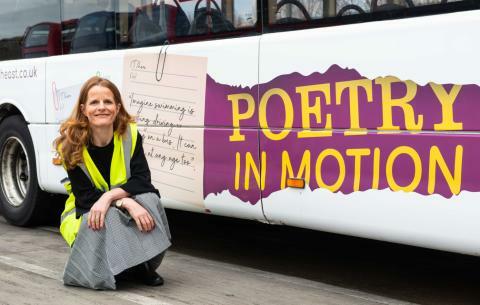 Poems by Newcastle-based writer, Anna Woodford, appear on a special Poetry in Motion bus on one of the award-winning operator’s most popular routes, which journeys across the Quayside and Great North Road. Seven of Anna’s pieces are emblazoned on the bus livery, each based on a three-year study called Co-Motion. Led by York University with Newcastle University, the project examined the link between mobility and wellbeing of over 55s living in Northumberland, York and Leeds. Carried out between 2014-2017, researchers explored how the attitudes and behaviour of the general public greatly impacted – often negatively – on the mobility of older people. Rose Gilroy, Professor of Ageing, Planning and Policy at Newcastle University and principal researcher on the Co-Motion project, explains: “The people involved in the research were going through a life transition, such as having just given up work, starting to live alone or losing sight, and our research looked at how that transition impacts on their sense of wellbeing and ways of getting about. Anna’s poems, which includes a six-strong sequence entitled (T)here, about the experiences of research participants, were previously featured on 100 Go North East buses in 2018, as part of the Great Exhibition of the North and also appear in her new poetry book 'Changing Room' (Salt, 2018). This January Go North East launched the Chatty Bus initiative, following research that three-in-10 Britons go at least one-day-a-week without speaking to anyone close to them. Designated 'Chatty Buses', had Chatty Bus Champions on board ready to start conversations with fellow passengers who wanted a chat.